Albert Esser died before 1962. Name Variation Robert Andrew Nachreiner was also known as Bob. Robert Andrew Nachreiner was born on 4 March 1936 at twin with Richard Paul, Richland, Wisconsin. He was the son of Leo Henry Nachreiner and Gladys Elizabeth Hemberger. Robert Andrew Nachreiner died before 2017. Neal McArthur married Dorothy (?). 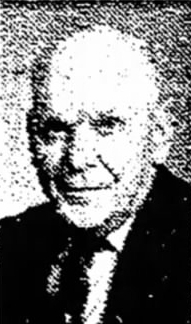 Neal McArthur died before August 1961. Married Name Her married name was McArthur. Dorothy (?) married Neal McArthur. (?) Farris married Anna Marie Alt, daughter of Michael Alt and Catherine Pletzer. Peter J. Vosen married Katherine M. Weitzel, daughter of Francis A. Weitzel and Margaret Anna Smith, on 22 June 1920. Peter J. Vosen died on 13 December 1984. Married Name 22 April 1902 As of 22 April 1902,her married name was Lord. Margaret Winifred Faber was born on 3 November 1880 at Wisconsin. She married Samuel Walter Lord, son of E. Lord and Anna (? ), on 22 April 1902. Margaret Winifred Faber died on 13 July 1975 at Wisconsin at age 94. Margaret Winifred Faber had 4 with 4 living in 1910 children. On 22 April 1962 Mr and Mrs Sam Lord - 60th anniversary. [S244] U.S. Federal Census 1910 U.S. Federal Census, by Ancestry.com, Year: 1910; Census Place: Ithaca, Richland, Wisconsin; Roll: T624_1732; Page: 7A; Enumeration District: 0094; FHL microfilm: 1375745. Mary H. Lord was born circa 1904 at Wisconsin. She was the daughter of Samuel Walter Lord and Margaret Winifred Faber. Mary H. Lord died before April 1962. Margaret Lord married (?) Gunderson. Margaret Lord was born circa 1906 at Wisconsin. Harold W. Lord was born circa 1907 at Wisconsin. He was the son of Samuel Walter Lord and Margaret Winifred Faber. Robert E. Lord was born circa June 1909 at Wisconsin. Walter Lord was the son of Samuel Walter Lord and Margaret Winifred Faber. Francis Lord was the son of Samuel Walter Lord and Margaret Winifred Faber. LaVerne Lord was the son of Samuel Walter Lord and Margaret Winifred Faber. (?) Gunderson married Margaret Lord, daughter of Samuel Walter Lord and Margaret Winifred Faber. Carl Lord was the son of Samuel Walter Lord and Margaret Winifred Faber. Gerald Lord was the son of Samuel Walter Lord and Margaret Winifred Faber. Married Name Her married name was Weston. Hazel Lord married (?) Weston. Hazel Lord was born on 8 September 1903. Hazel Lord died on 19 January 1986 at age 82. (?) Weston married Hazel Lord, daughter of Samuel Walter Lord and Margaret Winifred Faber. Lester C. Blackman married Mattie Roselip, daughter of John F. Roselip and Louisa Voelkel. Lester C. Blackman was born circa 1881 at Wisconsin. Name Variation Samuel Fingerhut was also known as Sam. Samuel Fingerhut was born in August 1886 at Wisconsin. He married Blanche Hoppe on 10 April 1910. Samuel Fingerhut died on 7 October 1960 at age 74. On 10 April 1960 at golden wedding anniversary. Married Name 10 April 1910 As of 10 April 1910,her married name was Fingerhut. Blanche Hoppe was born on 17 January 1893 at Wisconsin. She married Samuel Fingerhut on 10 April 1910. Blanche Hoppe died on 21 August 1964 at age 71. Name Variation Harlan Fingerhut was also known as Harland. Harlan Fingerhut was born on 11 April 1923. Harlan Fingerhut died on 27 September 1999 at age 76. 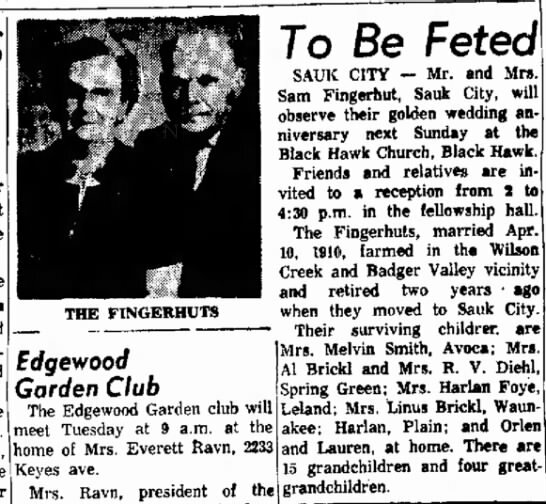 Orlen Raphael Fingerhut was born on 9 December 1910 at Spring Green, Sauk, Wisconsin. Orlen Raphael Fingerhut died on 29 May 1994 at Dane, Wisconsin, at age 83.